Heavy duty vinyl tarps have several handy uses especially in environments where material is required to handle a fair amount of abuse and environmental elements. Due to the heavier and thicker vinyl coating it provides considerable protection and long lasting properties. 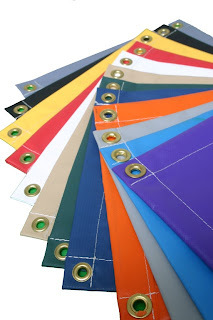 Available in a wide variety of colors as well as sizes allows one to select the tarp based on requirements for its use. The most common use for the product is for a wide variety of outdoor activities such as camping as well as other recreational events. This is because it delivers superb protection for campers against harsh sunlight, wind as well as the rain and cold. It is also durable and can be used for a long period of time. The tarp is also useful in the yard whether you wish to cover equipment or protect some other area around the house. A number of items can be placed inside the tent and be protected from a variety of elements. Some even use these tarps to protect motor vehicles and other important assets. Covering a wide range of goods is possible as the material is designed to be waterproof. Many make use of such products while on vacation as it can provide superior protection against the elements. A large number of people prefer these options as it is durable, reliable and is also easy to clean, maintain and set up. An advantage is to add the tarp on the back of a truck as stretched out which can cover cargo or secure the various items being transported. Each tarp is also abrasion resistant which means that it can withstand a fair amount of wear and tear. It is mainly used in industries of construction, agriculture as well as residential recreational use. The heavy duty vinyl tarps provide longer lasting properties for all protection needs. It is perfect for regular outdoor and traveling purposes. The vinyl tarps are also available in different sizes and colors.